Explore the Oakridge Outer Limits with a Mountain Bike Camping Tour! Home » Mountain Bike Tours » Explore the Oakridge Outer Limits with a Mountain Bike Camping Tour! Have you ridden Alpine, Dead Mountain, and Heckletooth, but are still begging for more? Or maybe you are discovering Oakridge for the first time and want to dive into uncharted territory? Go beyond the classics to less discovered trails with our new Oakridge Mountain Bike Camping Tour. We will head to the hills for this tour to discover gorgeous Timpanogas and Indigo Lakes tucked into the outskirts of Oakridge. Look forward to some high alpine riding, big climbs, and heart wrenching views. The “Sawtooth Struggle” will test your climbing legs as you advance up the ridges of the Cascade Crest. 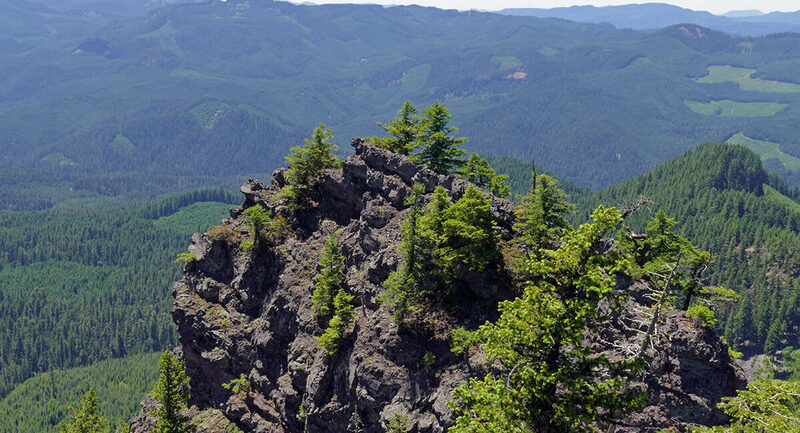 Middle Fork trail’s scenery and an undulating trail will keep you pedaling for miles – as you take in what it means to be riding in some of the best mountain biking in the country. We will finish with a big Moon Point shuttle, to ride a trail that will take you through a variety of climate zones with ripping descents. We promise you won’t be able to wipe the smile off your face with this equally gorgeous and thrilling tour to our favorite obscure trails of the Oakridge Outback. Meet us at Cog Wild Headquarters at 5:00pm or at Black Canyon Campground that evening, off Highway 58, west of Oakridge. Contact us for details. Beverages purchased at local Oakridge brewery, Brewers Union Local 180. Optional activities such as rafting or fishing on the Middle Fork of the Willamette River. All multi day tours will be charged a 50% deposit per person at the time of booking, $100 of which will be non-refundable. Cancellations 30-14 days prior to the tour: The participant will be required to pay 50% of trip price. Note: Guests can transfer to another tour at least 2 weeks in advance. If transferring tours to next year, transfer is good for the following year only. Personal emergencies do not void cancellation policy and tours go rain or shine. Travel insurance that covers trip cancellation as well as trip interruption is highly recommended. If we are able to re-sell your spot on a tour, we will refund you the full tour amount minus $75 handling fee. 50 – 75 miles over the three-day vacation. Strong intermediate to advanced. Riders should be physically fit and have various experience and skill with sustained climbs, steep descents and technical features. Narrow, fast, slow, smooth, rocky, rooty, steep and beautiful describe all the trails in Oakridge. You’ll also sample a wide variety of terrain – granddaddy old-growth trees, clear cuts, giant ferns, natural meadows, cold creek crossings, log bridges, exposure and rock outcroppings. Prepare for three full days of riding, so bring adequate clothing, including gloves and layers for a variety of weather. Hydration packs are necessary for carrying food and water. Helmets are required for all rides. We are also camping, so appropriate camp attire will include long pants, camp shoes and insulating layers for cool nights and mornings. Bring a swimsuit for dipping in the river! *There is poison oak on the sides of some of the trails we ride in Oakridge. Bring precautionary measures or extra-clothing if you are sensitive to poison oak. After meeting your guides at Cog Wild Headquarters, you’ll jump in the van and head over to Oakridge. We’ll make a pit stop along the way for dinner. Once we arrive at the campground, we will set up and settle in for the night under the canopy of giant trees. After a great fuel-filled breakfast we will hit the trails! Today you will conquer the Sawtooth Struggle, shuttling up to gorgeous Lake Timpanogas and riding further into the hills for high alpine riding, gritty ridges, and the steep but sultry trail to hidden Indigo Lake. The second day we will ride from camp along the Middle Fork Trail. We love this trail because it has a little bit of everything. Not only is the scenery gorgeous but the undulating trail with technical and intermediate sections of the trail will keep you guessing and thoroughly enjoying yourself. Today we will reluctantly pack up camp and head over to one of our favorite outskirt gems – Moon Point trail. Always a crowd pleaser, this fun descent through a variety of climate zones will have you begging for more – and more we will give! We can shuttle this ripping trail as many times as you can handle before we head back home.